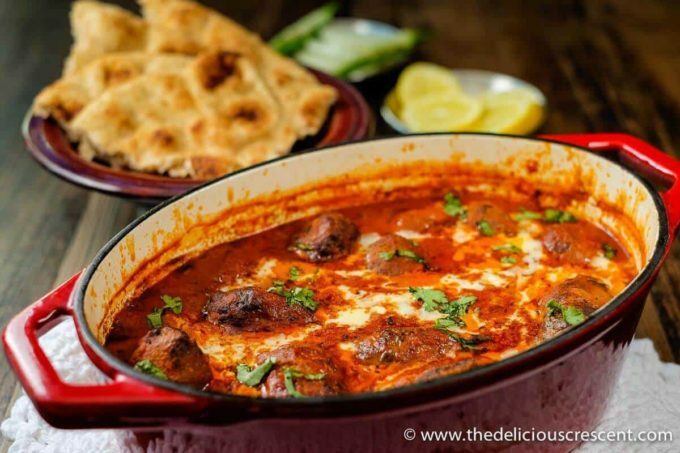 Kebab kofta curry is a delicious dish of succulent grilled or broiled beef meatballs in a rich, creamy and spicy gravy. The gravy in this recipe is much lighter than traditional versions, while retaining its creamy consistency and taste (video below). Kofta kebabs are grilled or barbecued meatballs that are popular in the Mediterranean, Middle East and the Indian subcontinent. 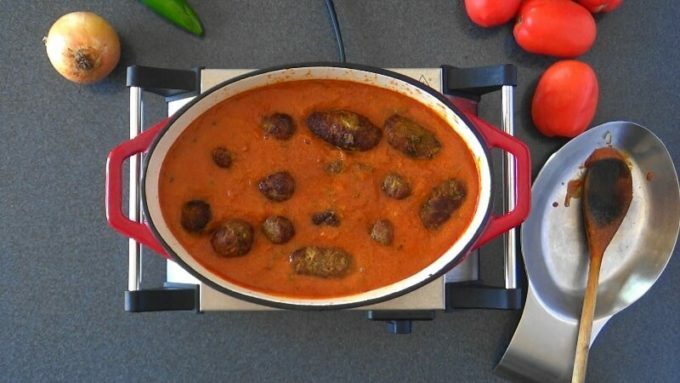 Here in this kofta curry recipe I have broiled them for ease of preparation. The process of grilling or broiling imparts a nice flavor. Some fat is also released out of the meatballs. And the rapid cooking process makes the meatballs juicy. Many traditional recipes use cream to add richness to this gravy. But I use yogurt instead of cream to achieve a rich consistency for this meatball curry. 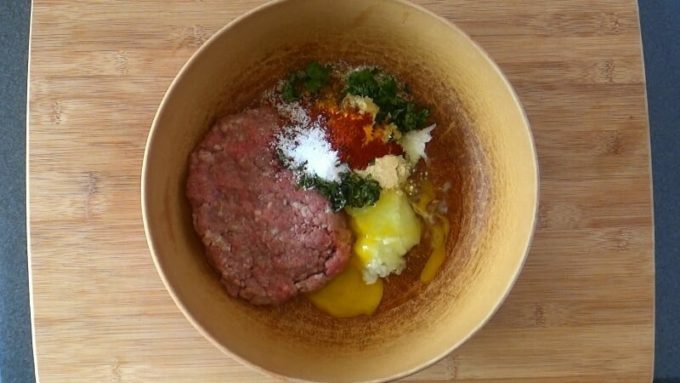 Ground meat lends itself well to many versatile preparations. On the blog I have a creative Mediterranean meatball dish that you make like – Creamy cauliflower stuffed meatballs. And then these Spicy meat and potato patties. 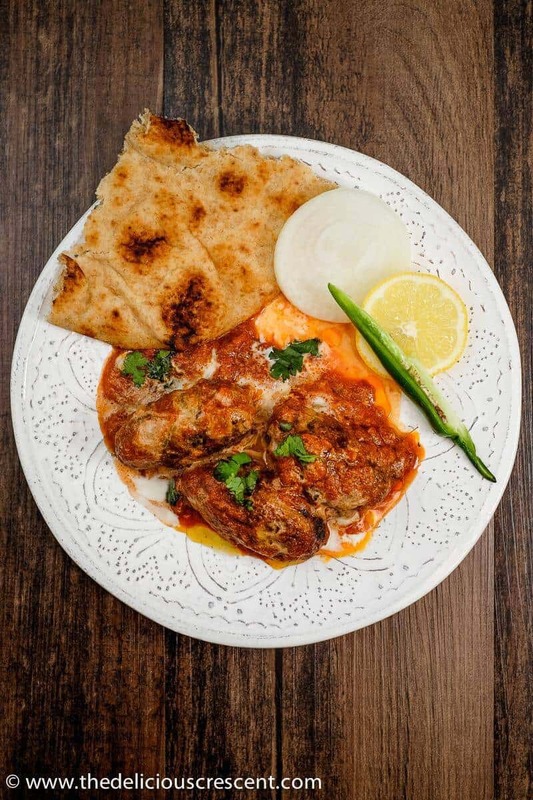 If you like rich tomato gravies, these are some to check – Khoresht Kadoo (Persian Zucchini Stew), Spicy tomato curry with eggs and Spicy rosemary tomato chicken. Meatball curry has an extensive list of ingredients. But the two main ingredients I will elaborate about are beef and tomatoes. I have used 90% lean beef and the broiling or grilling process will also help drain off some of the fat. Beef is a very good source of protein, some of the B vitamins (B12, Niacin, B6), zinc, selenium, phosphorus and a good source of iron. I would suggest using grass fed beef for its relatively superior nutrition quality, as it is richer in CLA (conjugate linoleic acid) and omega-3 fats. Research has shown that CLA is associated with several health benefits such as – prevention of cancer, reducing fat mass and increasing lean body mass, improved blood glucose tolerance, inflammatory system support and cardiovascular health. However, when it comes to red meat, moderation is recommended. Tomatoes are a treasure house of antioxidants – a rich source of vitamin C, beta-carotene and several phytonutrients. And are well known for being an outstanding source of lycopene and its association with cancer prevention. One key step I often use while making meatballs is to add grated onion. This imparts a nice oniony flavor and also makes them soft and moist. Some recipes also use grated zucchini to keep meatballs juicy. The beef meatballs should be broiled or grilled quickly at high temperature to brown the meat well on the exterior. If it is not done at the right temperature and it takes too long, then the meatballs can become dry. Make sure that the tomatoes are well cooked before adding the yogurt. Otherwise the yogurt will curdle and the gravy will not be smooth and will look messy. I like to use creamy whole milk yogurt. Be sure to use grass fed dairy products whenever you can, that way you get more of the CLA that I talked about in the previous section. 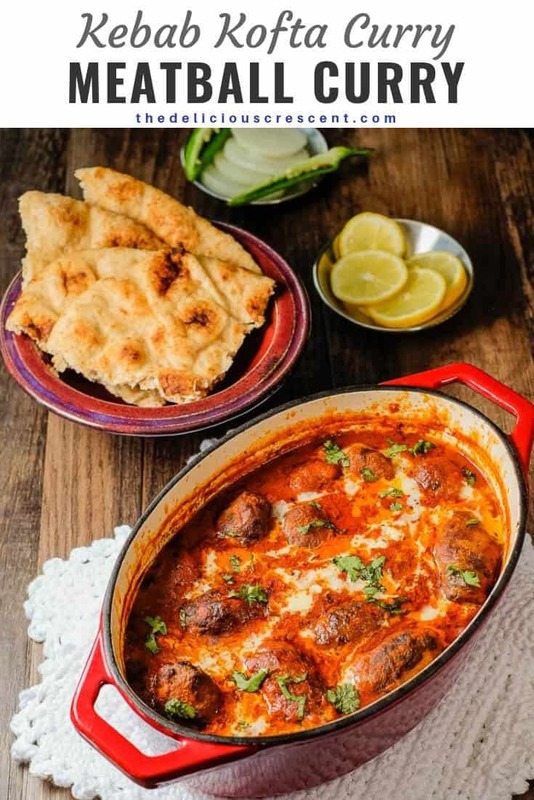 The gravy in this beef meatball curry recipe is pretty rich and creamy with the addition of yogurt. But if you want to add a richer flavor for special occasions, then you could drizzle some ghee or cream on the top, just at the end of the cooking process. 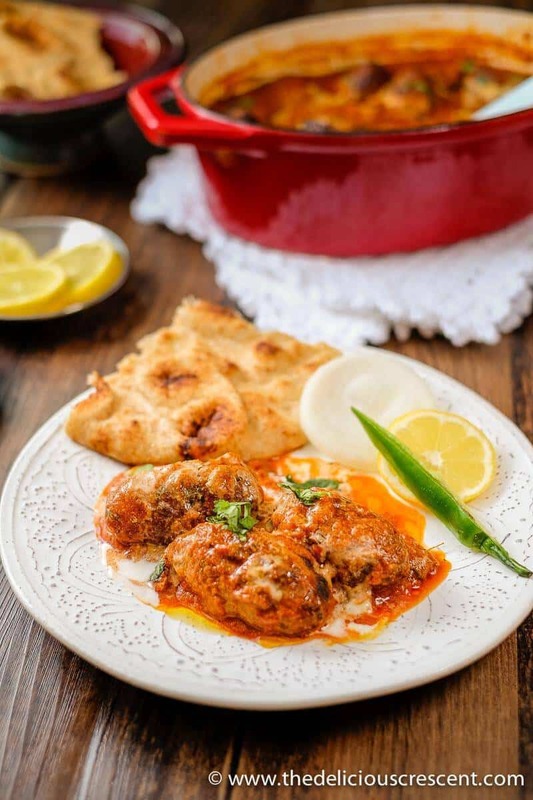 Kebab kofta curry is a delicious Indian dish of succulent grilled or broiled meatballs in a rich, creamy and spicy gravy. The gravy in this recipe is much lighter than traditional versions, while retaining its creamy consistency and taste. 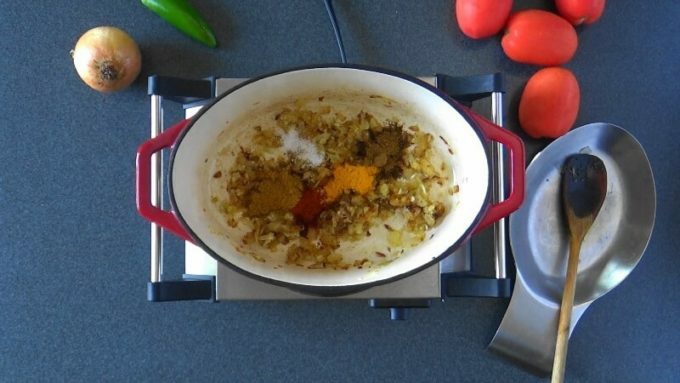 Place all the ingredients for kofta (meatballs) in a mixing bowl. Mix and knead it well for 3-4 minutes. Let it rest as you prepare the gravy. Heat the olive oil in a cooking pot over medium heat. Add chopped onions and sauté until golden brown. Add the ginger and garlic paste and stir for 2 minutes. Add the tikka masala, paprika, turmeric, cumin powder, coriander powder, salt and mix well. Then add the anaheim peppers, tomato paste and stir 2 minutes. Next add the crushed tomatoes and stir it in. Add the whipped yogurt and stir thoroughly. Add the fenugreek leaves, which give a distinctive taste to this dish. Then add 1 cup of water and stir (adjust the water as needed). Let it simmer about 20 minutes. Shape 16 smooth and cylindrical (or round) koftas and set aside. 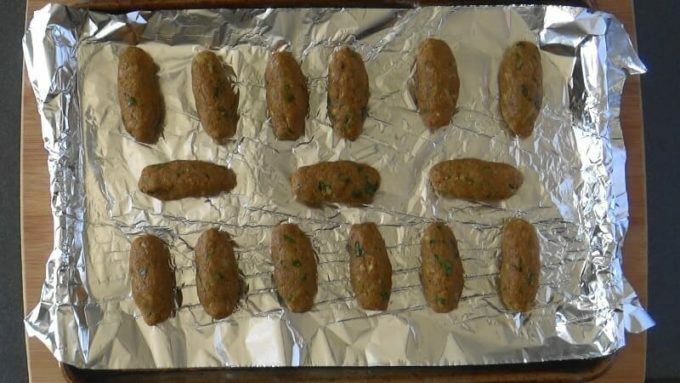 Place the koftas on a baking sheet lined with aluminum foil and broil it on high for about 3 to 5 minutes on both sides. The broiling time may differ with each oven, so make sure to check initial progress. Alternatively the koftas may also be grilled or barbecued. The koftas do not have to be completely cooked in this process as they will cook further in the sauce. If necessary, you may use a blender and process the gravy until smooth. Add the koftas to the gravy. Adjust seasoning and gravy consistency as needed. Bring it to a boil and then simmer for about 10 minutes. Sprinkle chopped cilantro leaves on the top. May drizzle cream or whipped yogurt on top. 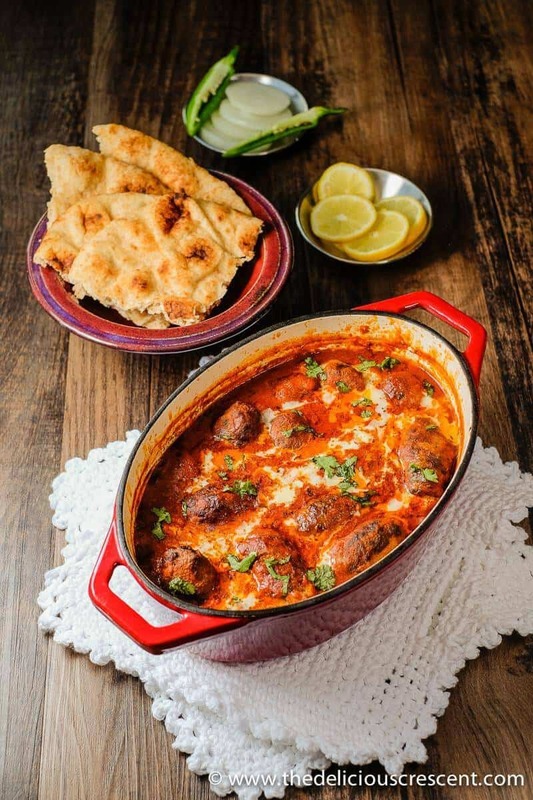 Serve this beef meatball curry with rice or flat bread. Enjoy! 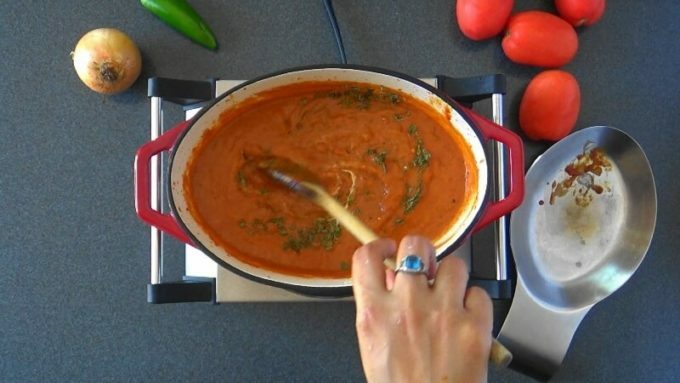 If you prefer to use fresh tomatoes for the gravy, chop and puree 1 pound of fresh tomatoes with the skin and seeds, along with 1 tablespoon tomato paste. If using fresh tomatoes, you may skip addition of water in the recipe, and add the yogurt only after the tomatoes are very well cooked. Otherwise the yogurt will curdle and the gravy will not be smooth. I prefer to use grass fed whole milk yogurt. You could also try using tomato paste (1/2 cup double concentrated good quality tomato paste + 2 cups water). Use grated onion or grated zucchini for soft, juicy and moist meatballs. Meatballs should be broiled or grilled quickly at high temperature to only brown the meat well on the exterior. If it takes too long, then the meatballs can become dry. For a richer flavor or special occasions, drizzle some ghee or cream on the top, at the end of the cooking process. I haven’t tried this dish yet…it looks delicious. This sounds delicious, I can’t wait to try it for dinner one night! So glad you like it Trang! Let me know if you have any questions. Oh thank you Sandra :) Hope you enjoy it. This is a quality recipe created with so many wonderful spices and flavors. Very nice!